13-06-13: Müll - You have to see it! Tickets are available starting one week upfront at the Moviemento cinema. Be there!! 26-05-13: Müll - Der Trashfilm (aka Trash - The trashmovie)! 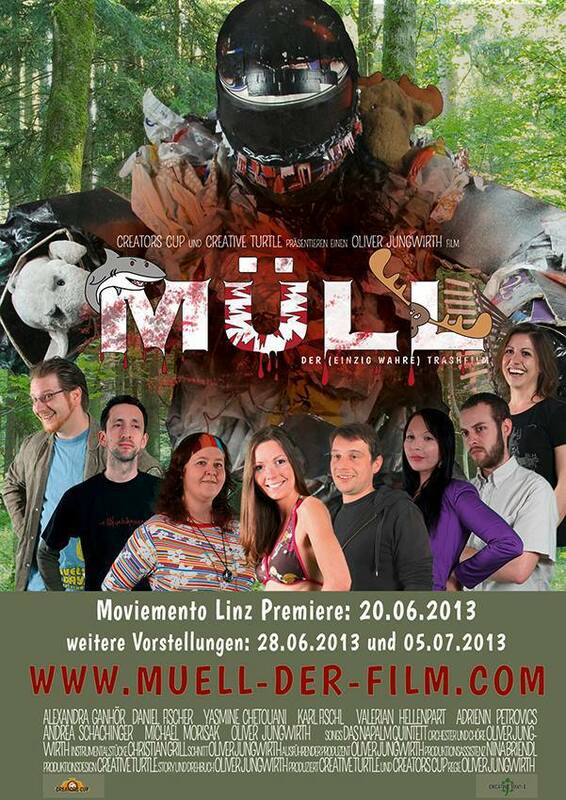 "Müll - der (einzig wahre) Trashfilm" is an Independent Produktion by Creative Turtle in cooperation with Creators Cup. The movie is a trashmovie with humor, irony, suspense, action and lots of charming characters you will remember. You can find all the important things at http://www.muell-der-film.com/ (in German). World premiere is on June 20th 2013. Oliver surprised us with a greate new idea for a movie. We all agreed, that we wanted to make this movie this year and so Oliver soon gave us a script to read. He also found a few new faces for this movie. Summer came and went and now we're nearly done shooting. One thing is already certain: This is going to be a great movie! The music video to "Run" by Aquarian Age is done! Watch the video and read more here. The music video for the austrian band Aquarian Age is almost completed. Watch this space for more information. Oliver put his "old" movies "Zwang/Haft" and the music video for "Perfect Day" (Aquarian Age) online. For the first time there's also a "long and silly"-version available. Martin presents the experimental shortmovie "9 m m"
BLUADSAUGA - Creators Cut will be shown on 30th January 2010 at Ann & Pat (Directions). We'll start at 19:30 with free entry! Haven't you always longed for "Bluadsauga - The movie" merchandising products? Then visit our new Bluadsauga shop, where you can get all the goodies you always wanted to have! 10-08-08: Creators Cup proudly presents "Nick Needle"
This thriller tells the soundless story of a delicate drug deal ending in a sensational shootout. You can find the details at http://nickneedle.creatorscup.at. We have formed a club called "Creators Cup Verein zur Unterstuetzung von Filmschaffenden". Yippie! Oliver published his book "Monod". The rest of Creatorcup congratulates him on this truly terrific news. You can find more information on "Monod" at http://www.monod-das-buch.at.tt. Today Bluadsauga Creators Cut was release and the new homepage is online. Enjoy! It has arrived. The Bluadsauga CREATORS CUT is done, as is the DVD. We'll go into production (may take a little longer) and then the public will see it as well. No excuses. The subtitled english version for our non-german speaking fans is nearly done and will be sent to our friends abroad (yes, that's you, James!). As soon as we know, where and when Bluadsauga will be shown, we'll let you know. Oliver could not keep his fingers from Bluadsauga and gave it a completely new cut. The director's cut in 16:9 features besides the (mandatory) new cut also new music, new making-of and a new trailer, which of course you'll get to see here at creatorscup.at. Additionally the long-sought translation of Bluadsauga is also in the works as well as another big screen showing. Details will follow. Well well, this was overdue for quite some time, but dear David forgot to upload the pages. Anyways, upon surfing to http://creatorscup.at/bluadsauga you will be checked for your browser's favorite language and then you will be transferred to the appropriate pages. If any problems occur, please post a message to the guestbook or send an e-mail to office at creatorscup.at. Creatorscup.at has a new sensational attraction: its own full-featured guestbook! Don't hesitate and leave us a nice message. We are proud to announce that our movie "bluadsauga" (bloodsuckers) will be released on DVD. We don't know the exact time or price for the DVD yet, but we DO know, that there will be two different editions available. First of all the "Single-Disc" including the movie, movie-trailers and the music-video "bluadsauga" performed by the band Hinterland (the movie can be ordered with english subtitles). The "Double-Disc" will include all material of the single Disc but will be enhanced with bonus material such as Interviews with Cast, Making-Of and Bloopers (no subtitles available for the bonus-material, sorry folks). If all works well the DVD will be released end of september. We're really looking forward to it. You can preorder it by mailing to office at creatorscup.at. Creatorscup.at is now available in english as well. Language detection checks whatever language you have configured in your browser. If you like to see other languages as well, you can reach it through the links on the bottom of the page. Well, there are a few ideas in our heads, mostly about short-movies and such things that we would like to put into practice every now and then. So, if you want to take part in it: Fine – you’re welcome, make yourself comfortable and mail us at: office at creatorscup.at. Don’t be nervous. Bluadsauga (bloodsucker) is a vampire movie mostly made by Oliver Jungwirth. 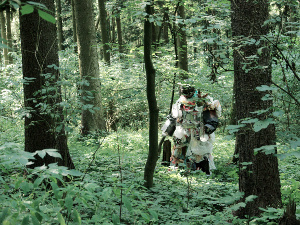 The movie was done in cooperation with the culture club Kunst-WerkT and Creators Cup. 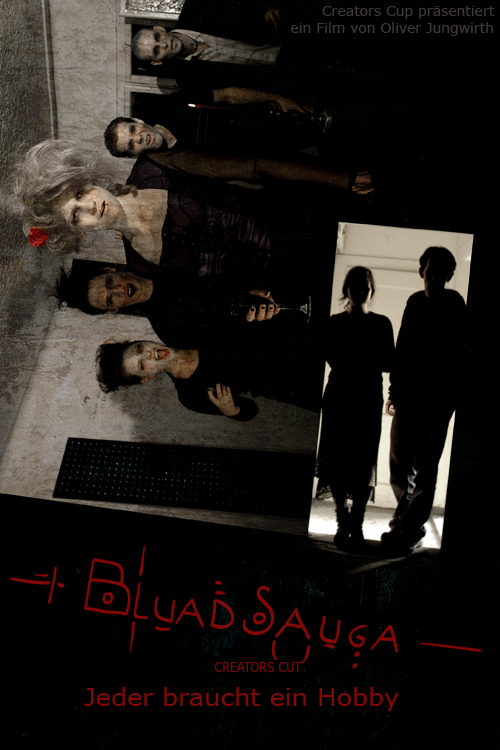 Bluadsauga is the first project by Creators Cup and the biggest (and final) movie-project done by Kunst-WerkT. So it is a very special event. Amazingly we (well, actually Oliver) were able to organize two presentations in the cinema “Moviemento” in Linz. The opening night will take place on July, 12th and the second presentation on July, 13th. Tickets are only available under and above the hand by members of the production-crew. If the presentation will work out fine, we’ll be sure to organize other presentations. Place and time will be announced here. For curious people and those who want to know it all, here are the details on the movie. Yippie, Creatorscup.at finally goes online after a not so long development. At this moment the site does not contain much content, but that will change over time for sure. Have fun reading, your Creators Cup team. © 2009 Creators Cup, office at creatorscup.at, Impressum.